Dr. Steven Turkeltaub of the Arizona Center for Aesthetic Plastic Surgery details the distinctions between a mini and full tummy tuck, as well as what to expect during recovery. 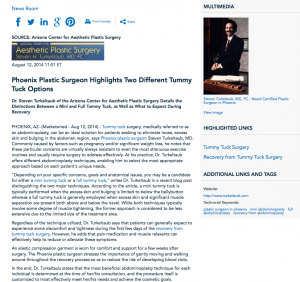 Phoenix, AZ — Tummy tuck surgery, medically referred to as an abdominoplasty, can be an ideal solution for patients seeking to eliminate loose, excess skin and bulging in the abdomen region, says Phoenix plastic surgeon Steven Turkeltaub, MD. Commonly caused by factors such as pregnancy and/or significant weight loss, he notes that these particular concerns are virtually always resistant to even the most strenuous exercise routines and usually require surgery to address effectively. At his practice, Dr. Turkeltaub offers different abdominoplasty techniques, enabling him to select the most appropriate approach based on each patient’s unique needs. “Depending on your specific concerns, goals and anatomical issues, you may be a candidate for either a mini tummy tuck or a full tummy tuck,” writes Dr. Turkeltaub in a recent blog post distinguishing the two major techniques. According to the article, a mini tummy tuck is typically performed when the excess skin and bulging is limited to below the bellybutton whereas a full tummy tuck is generally employed when excess skin and significant muscle separation are present both above and below the navel. While both techniques typically involve some degree of muscle tightening, the former approach is considered to be less extensive due to the limited size of the treatment area. Regardless of the technique utilized, Dr. Turkeltaub says that patients can generally expect to experience some discomfort and tightness during the first few days of the recovery from tummy tuck surgery. However, he adds that pain medication and muscle relaxants can effectively help to reduce or alleviate these symptoms. An elastic compression garment is worn for comfort and support for a few weeks after surgery. The Phoenix plastic surgeon stresses the importance of gently moving and walking around throughout the recovery process so as to reduce the risk of developing blood clots. In the end, Dr. Turkeltaub states that the most beneficial abdominoplasty technique for each individual is determined at the time of her/his consultation, and the procedure itself is customized to most effectively meet her/his needs and achieve the cosmetic goals. Dr. Turkeltaub is a board certified plastic surgeon with offices in Scottsdale and Glendale, AZ. After earning both his bachelor and medical degrees as part of the honors Six-Year Medical Program at Boston University and Boston University School of Medicine, he completed his general surgery residency at the University of Miami/Jackson Memorial Hospital followed by his plastic surgery training at the University of Massachusetts Medical Center. Devoted to continuing his medical education, Dr. Turkeltaub maintains active membership in the American Society for Aesthetic Plastic Surgery, the American Society of Plastic Surgeons, and several other prestigious medical societies. He is available for interview upon request. For more information about Dr. Turkeltaub and his practice, visit turkeltaub.com, arizonabreast.com, or facebook.com/drturkeltaub.